This Banner Mounting Bracket is Made for Displaying a Single 36"w Flag! Additional Pole Hardware Sizes are Available! Each Banner Mounting Bracket is Reasonably Priced! Wind tunnel tests show 87% reduction of the wind load. Bandings are 40" long to fit most standard lampposts. Zip ties and pole pins secure the street flag to hardware. Banner mounting bracket is made of cast aluminum for long term use. 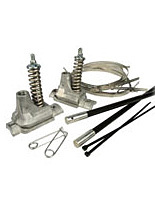 This lamppost hardware set is a banner mounting bracket that is heavy duty. These light pole flag accessories are made of rust resistant cast aluminum for use in rain, snow, sun, or wind. Each banner mounting bracket is a great source of marketing. Street pole hardware is displayed above ground level so consumers cannot miss them whether they are walking downtown or driving on a college campus. This banner mounting bracket is wind tunnel tested. The test proved that this street pole hardware is strong and would last even in strong winds [see report below]. This is a banner mounting bracket for marketing an event with (1) 36"w flag. Light pole hanging hardware is often used at amusement parks, town centers, campuses, shopping districts, and more. 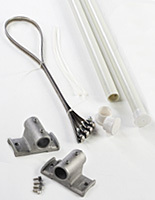 These lamp post display kits come with 40"l bandings to fit around most standard posts up to 12-3/4". Each banner mounting bracket can easily change the flags out with the seasons or for different events. Users will just need to purchase more zip ties at the local hardware store. Consumers can adjust the unit on the pole by loosening the bandings then retightening them. This banner mounting bracket, called street pole hanging hardware, is priced low since it does not have come with the "on-post adjustment" feature. This light pole hanging kit is a banner mounting bracket that just needs a flag and a lamp post. 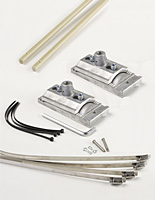 This hardware kit includes (2) fiberglass arms, (2) brackets, (6) bandings, (2) pins, (2) zip ties, & installation instructions. This flag pole display is a banner mounting bracket that is easy to install with the instructions as a guide.